I’ve been working with data over the entire US with data points for each county. You could do the same sort of thing as I am doing here if you have a list of data values with latitude and longitude coordinates or county (or state) FIPS codes. For now, let’s just look at county populations. I’m going to map these data by the location of county population centroid (so by latitude and longitude coordinates, ie points). You could also look at the data by county polygons given by a shapefile (by FIPS code), but I’ll save choropleth mapping for another post. First, I’m going to grab some public data on the county populations and locations of county population centroids in the US from the 2010 census. Restrict to the continental United States. Now that I have a dataframe of latitude and longitude points, I’ll drop some columns and convert to a spatial object in R.
+x_0=180 +y_0=50 +ellps=GRS80 +datum=NAD83 +units=m"
I’ll manipulate this data a little bit to plot nicely. 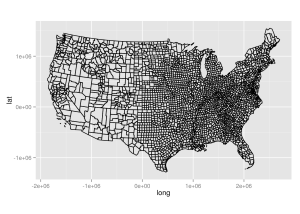 ## Source: "gz_2010_us_050_00_5m.shp", layer: "gz_2010_us_050_00_5m"
Make plots of the US population. I like to use ggplot2, since I think those plots look the nicest. ## This plots an outline of counties. ## This plots an outline of states. 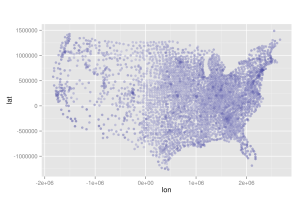 ## Here is a plot of all the county population centroids alone. ## This plots an outline of states and the population centroids on top, you could do the same for counties if you wanted to, but that seems like overkill to me. 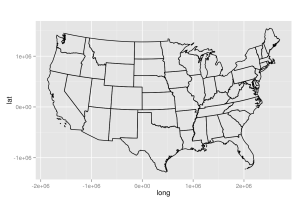 And that’s how you overlay a map of data values with latitude and longitude coordinates on a continental US map using R’s ggplot2. Happy mapping! !